A King hears about a lady who makes the most beautiful quilts and he demands that she makes him one. The lady refuses but the King insists. 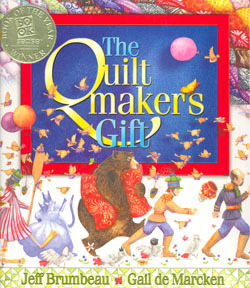 She tells him that she will make him a quilt only if he gives away all his possessions. The King then travels the world giving away all he owns until he has nothing...but a beautiful quilt. 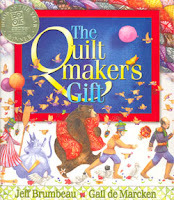 The illustrations are truly beautiful and the quilt pieces aid in telling the story. The story progresses at a steady pace and it does not include unnecessary information to bog the story down. It is a very long story that may be difficult to read in full without students becoming fidgety. I had intended to use this book with lower grades until I received my copy and realised it was much longer than I had anticipated. It is a very inspiring story however that does work well with older grades. In addition the lessons the King learns can be adapted in multiple ways for lessons on generosity for health, writing activities and in art. It is a unique perspective on a topic that really needs new resources to bring it back to life in the classroom. I recommend to buy it but do keep in mind that I would not recommend it for any students below grade 3.